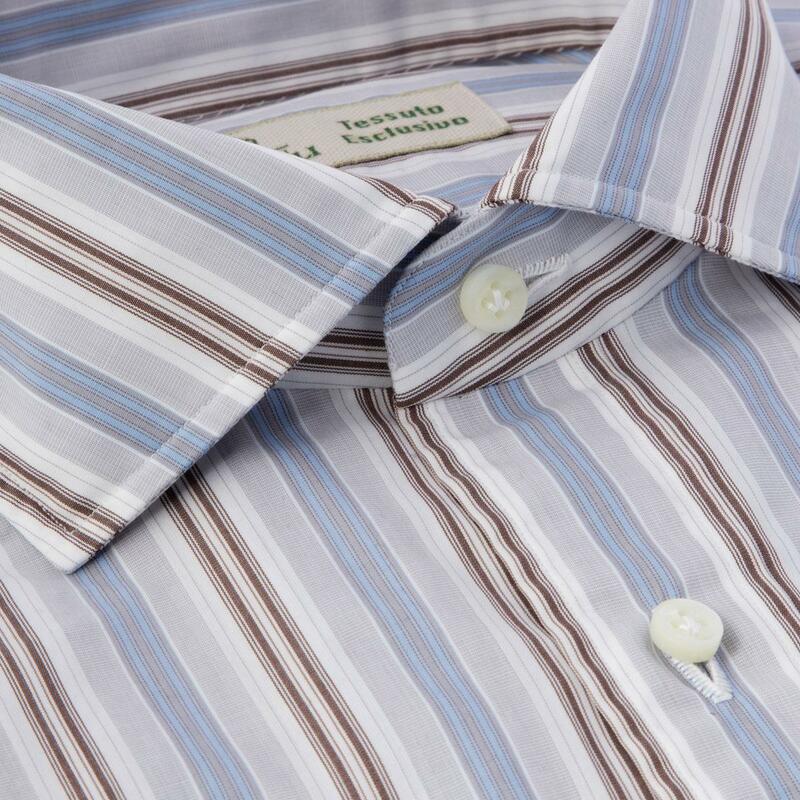 Luigi Borrelli Exclusive Fabric Striped Shirt. Semi-French Collar with Extractable Sticks. 5mm Stitching (Collar and Cuffs Only). 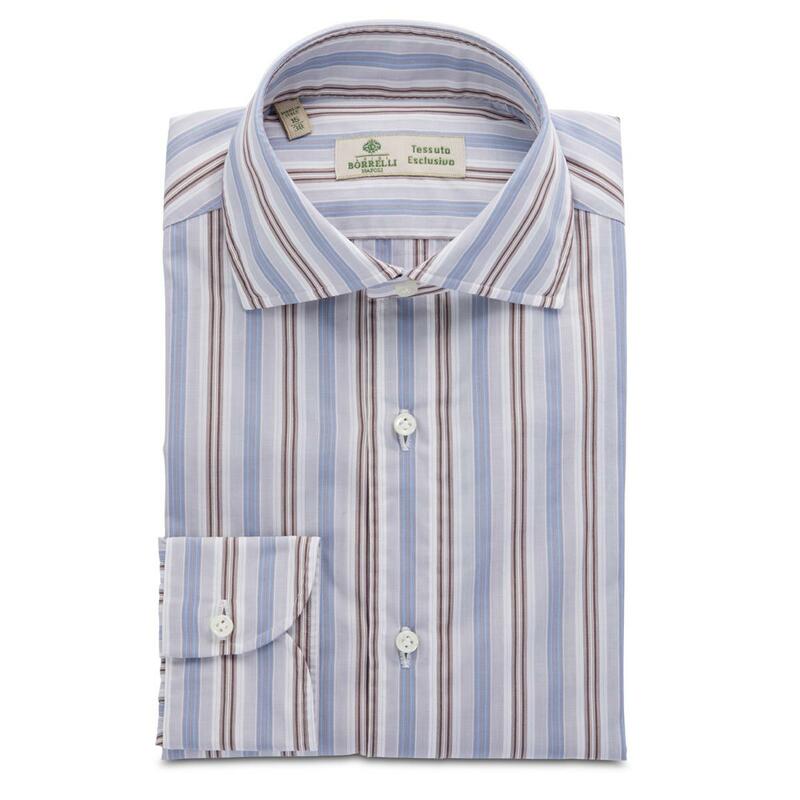 ARMHOLE: Our embroiderers' hand stitching gives this part of the shirt a truly exceptional softness. 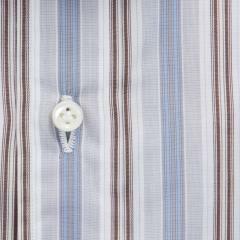 COLLAR: As this is the most delicate part of the whole shirt, only the most expert embroiderers are entrusted with hand-stitching our collars. 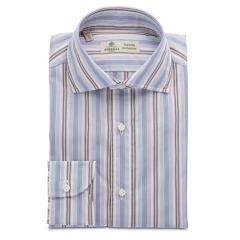 GUSSET: This is the small fabric triangle at the bottom of the shirt which binds the front and back of the shirt. It is hand-sewn exclusively to ensure greater strength. 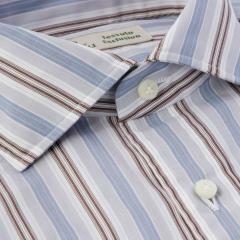 TRAVETTO: The hand-stitched embroidery which closes the sleeve vent is a distinctive feature of Luigi Borrelli shirts. 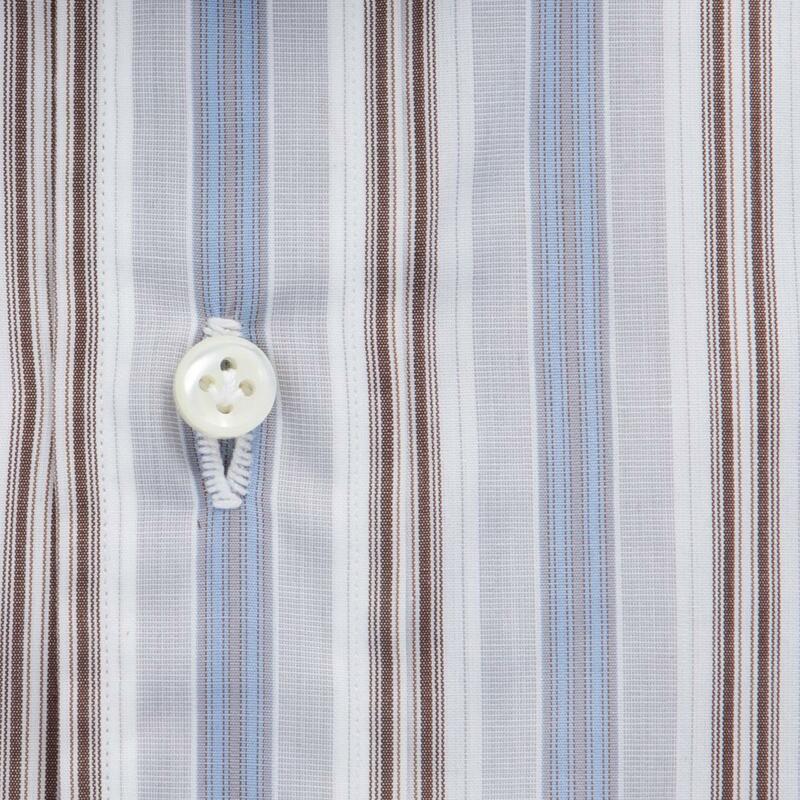 BUTTON: Expertly hand stitched using zampa di gallina (Chicken's Paw) stitching method. SHOULDER: Exclusively hand-stitched to eliminate the tightness created by machine stitching and ensure softness and perfect fit. BUTTONHOLE: Hand stitched by our embroiderers to last in time being flexible and resistant. 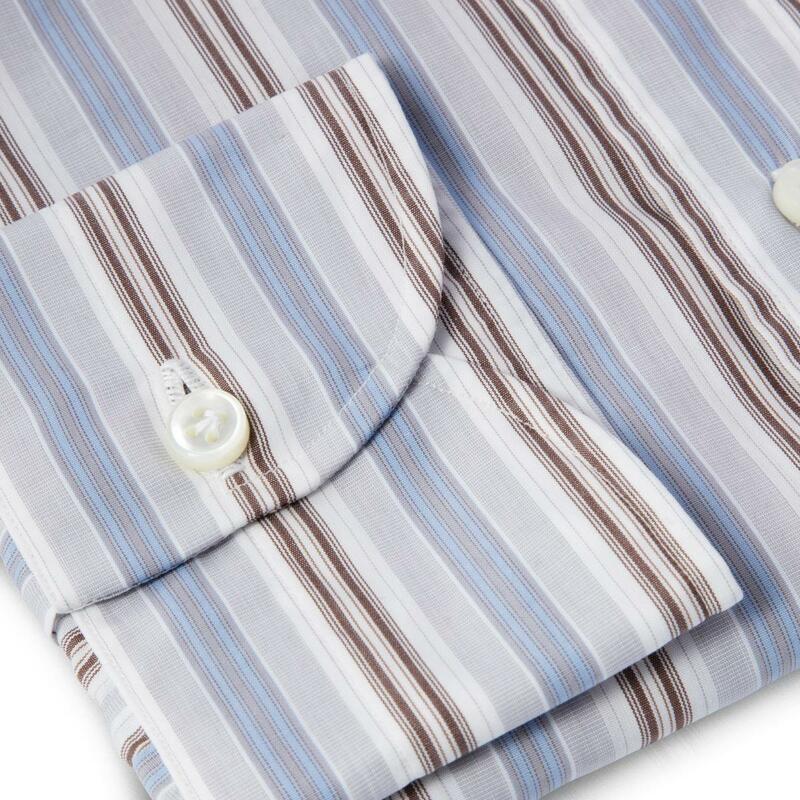 PLACKET: This eighth step involves attaching the placket using a flexible stitch which ends at the travetto obtaining a stylish and high quality embroidery. Measurements on Size 38: Shoulders length: 43,4cm; Sleeve + cuff length: 67,1cm; Length: 73 cm; Chest length: 113 cm; Waist width: 98cm. Wash and Care: Hand Wash or 30° Machine Wash.
Leave a Comment? Effettua il login - Sign Up! You must select a size and a color to continue.